Some of the following computer modules haven't been completely fused during the manufacturing process. This could lead to non-booting modules in rare cases. Another reboot try usually solves the issue. 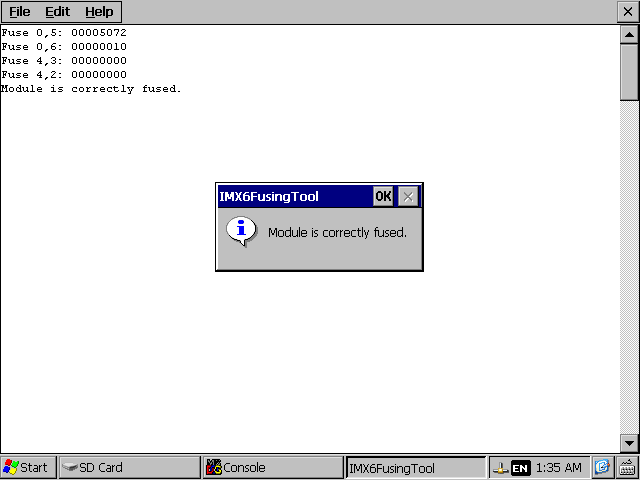 Users who used the pre-installed Toradex Easy Installer to flash their module are not affected as this tool fuses the modules correctly anyway. Note: Only a limited number of products below are affected, by far not all of them. Customers who received affected products have been informed by email with a list of serial numbers affected by this issue. The i.MX 6 processor on the affected modules was not fused for fast boot mode. Not fusing to this mode can lead to modules which don't boot reliably. This means, they mostly boot correctly, but rarely don't boot at all. We list options to check/fix this issue using the Toradex Easy Installer, U-Boot, and WinCE below. The modules come with a pre-installed Toradex Easy Installer. Using this tool to flash any operating system automatically fuses the processor and therefore fixes the issue automatically. However, it can also be done manually through commands. The following commands in U-Boot can read/fix the fuse settings of the processor. This works for the standard Toradex U-Boot for iMX6 modules but also with the U-Boot used with the Toradex Easy Installer. There is a tool to read/fix the fuse settings. It works in GUI and command line mode. To use GUI mode just launch the tool without any command line parameter. The tool will dump on the console the current state of the fuses and, depending on their value, you may have two different messages. If the fuses are in the correct state, you'll see an information message. 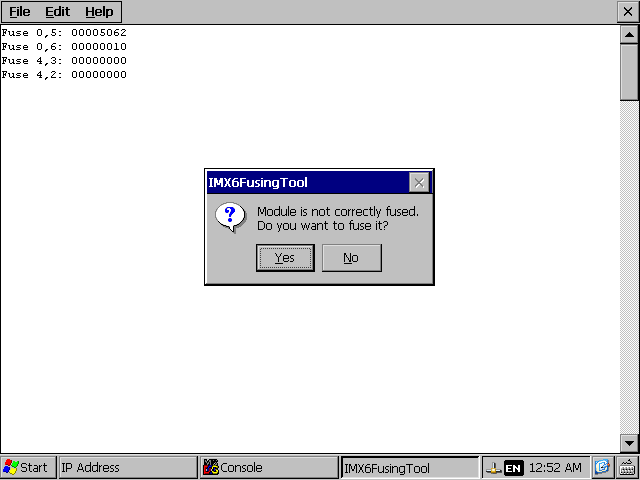 If fuses are not correctly configured the tool will ask you if you want to fix that. If you select "Yes", the module will be fused and a confirmation message should appear. To use command line mode you need to run the tool with a command line switch. 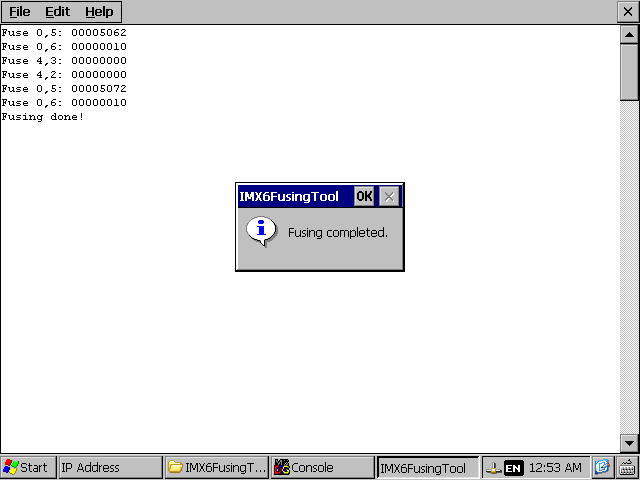 The tool will first dump the state of the fuses on the console and, if enabled, on the debug serial port. Otherwise the behavior depends on the command line switch you selected. Module is not correctly fused!